Flooding on the Missouri River will result in continued flooding on a portion of the Grand River. 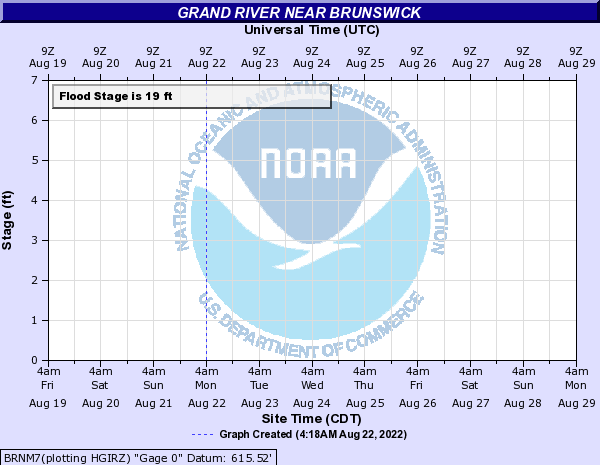 Flooding continues on the Grand River at Brunswick through this weekend. The National Weather Service predicts the river level will level off at about 20 feet Thursday, and a remain a foot above flood stage of 19 feet until Saturday morning, before slowly fall back below flood stage by Monday evening. This is in part due to the flooding expected on the Missouri River between Miami and Glasgow.